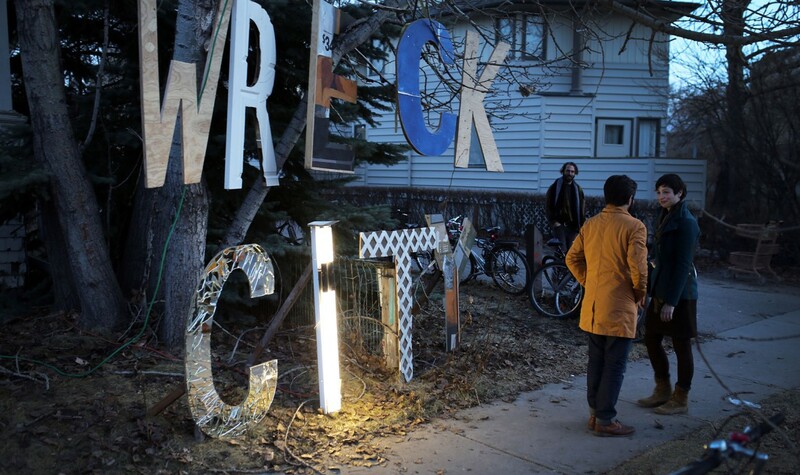 WRECK CITY: AN EPILOGUE FOR 809 is a documentary about a ground breaking art experiment where 150 DIY artists rebuilt a city block full of houses, slated for demolition in Calgary, into an art, installation and performance village. The biggest project of its type in the history of Calgary, Wreck City invited over 150 artists to participate. Operating on good faith, a shoestring budget, and naive energy, a curatorial collective facilitated the project, negotiated by-law, police complaints, graffiti, and accusations of aiding and abetting gentrification. Created in a month and open to the public for just over a week, artists crafted accessible works of public art dealing with a vast number of issues and themes, including gentrification, community, and the institutionalized art world. Over the course of 9 days in April 2013, 10,000 viewers passed through the exhibition. Shortly after, the houses located in the neighbourhood of Kensington were demolished, and a glassy beige condo building was erected in their place. Working in Calgary and Montreal as a professional media artist, filmmaker, and the Creative Director of Nur Films, a one stop creative and production firm, Ramin Eshraghi-Yazdi has to date directed over 400 projects, many of which have been broadcast, screened, and garnered awards and recognition from film festivals and peer review agencies, locally, nationally, and internationally. From experimental art instillation and documentary work to broadcast commercial, music videos, and episodic programs, as well as a slew of short films, Ramin is inspired by all that is visually stunning and stories not often told, and though his interests vary, his mindset is always tainted with an indie sensibility that favors composition and style. After Party following the screening! * Ticket holders will receive $2 off admission. Thérèse attempts to slay one of her biggest regrets in life: never learning to drive. At 86 years old she will go all in and work harder than she’s ever worked before in one, last, bold attempt to obtain her Alberta Class 5 operator’s permit. Director Ramin Eshraghi-Yazdi, Producer Caitlind R.C. Brown and Wreck City artists in attendance!